"These enchiladas are absolutely amazing! Truly a recipe your family will love." Cook and stir ground beef with onion in a skillet over medium heat until meat is crumbly and no longer pink, about 10 minutes. Drain grease. Stir 1 cup Cheddar cheese, sour cream, parsley, taco seasoning, oregano, and black pepper into the ground beef until cheese has melted. Mix in enchilada sauce, chili powder, garlic, and salt; bring to a simmer, reduce heat to low, and simmer until meat sauce is slightly thickened, about 5 minutes. Lay a tortilla onto a work surface and spoon about 1/4 cup of meat sauce down the center of the tortilla. Top meat sauce with 1 tablespoon black beans and a sprinkling of black olives. Roll the tortilla up, enclosing the filling, and lay seam-side down into a 9x13-inch baking dish. Repeat with remaining tortillas. 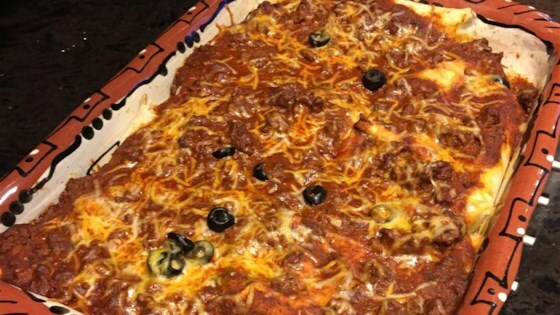 Spoon any remaining meat sauce over the enchiladas and scatter any remaining black beans and black olives over the top. Sprinkle tortillas with 1/4 cup Cheddar cheese. Bake in the preheated oven until cheese topping is melted and enchiladas and sauce are bubbling, 20 to 22 minutes. Let stand 5 minutes before serving. These saucy beef enchiladas are simple and quick to make. I did not enjoy these at all and I think the reason why is that with flour tortillas they weren't enchiladas, they were burritos. Not great. really good flavour - I made it this evening and it was lovely. Really easy to put together.